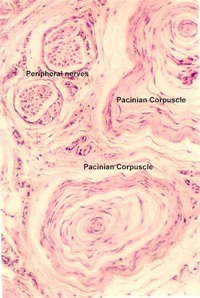 Spinal Cord Histology | Microanatomy Web Atlas | Gwen V. Childs, Ph.D.
Identify: a. 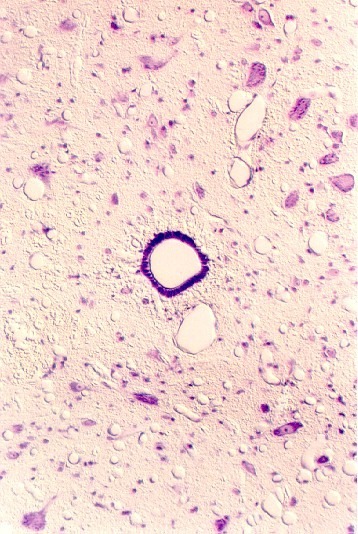 Large motor neuron, b. Central canal, c. region of white matter. 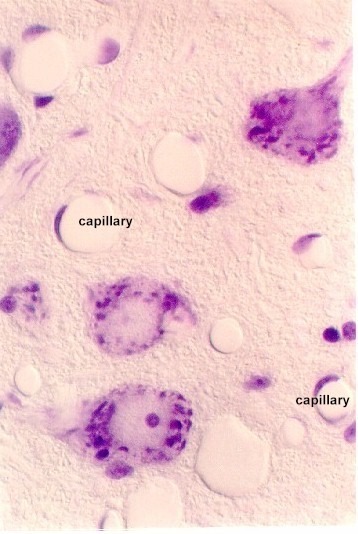 What types of cells line the central canal? The next photographs illustrate motor neuronal cell bodies at higher magnification. Also, there are small capillaries in the field lined by a single endothelial cell (simple squamous epithelium). Compare these fields with an electron micrograph of a neuronal cell body. 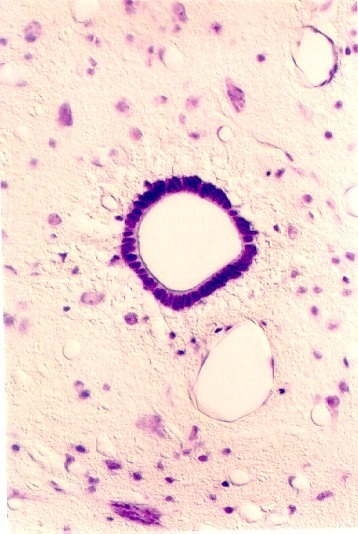 In this light microscopic view, the dark purple patches in the cytoplasm are called Nissl bodies. The nucleus is clear. What is being stained by the Nissl stain? 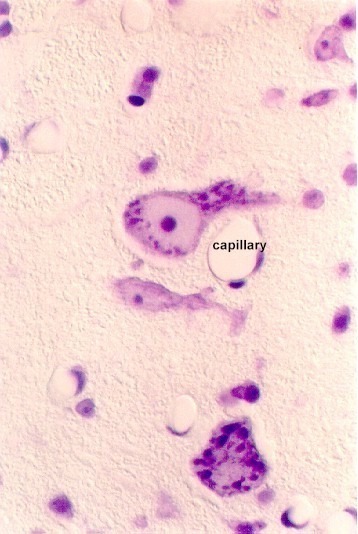 If you were to look at the EM view of the darkly stained structure in the nucleus (n), what would you expect to see? 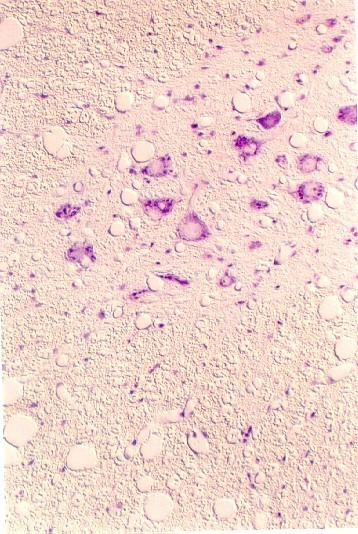 Dendrites contain Nissl bodies, but axons do not. Can you find both dendritic and axonal processes in either of these fields? Label them. Finally, astrocytes and oligodendroglial cells are evident, especially in the white matter. 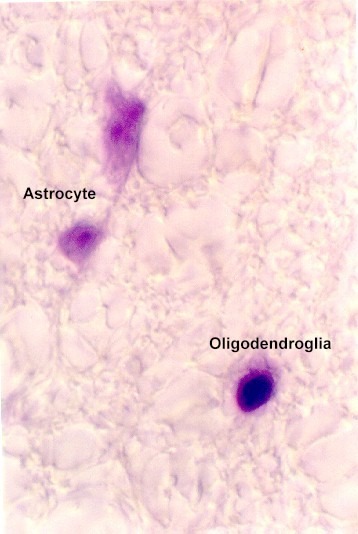 The following photographs illustrate the two types of glial cells. 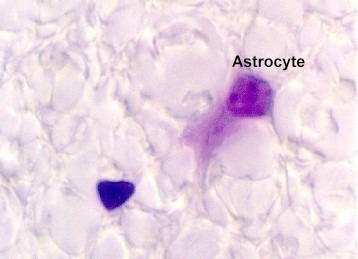 The astrocytes have the lighter colored, larger oval nuclei. Which cell is responsible for the myelination of fibers in the central nervous system?